As a volunteer at Poplar Spring Animal Sanctuary, I don’t see the regular weekday employees often – mostly only during events. Luckily during one event I asked to help out in the chicken yard for my volunteer duties, and I got to know two of the weekday employees who work in the chicken yard. They know so much about the chickens, their personalities, and I loved it, so now I ask to have chicken yard duty at every event! I loved, this, and I look at the chicken blog for little bits of information. It came in handy today. I had just read the “blog” and thought to myself how cute that was. 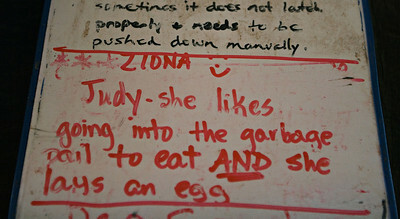 (Note: “garbage pail” is referring to the garbage pail filled with chicken feed, not garbage!) A minute later I was collecting the water bowls to be cleaned, and there was Judy making a pretty big fuss by the feed pail. 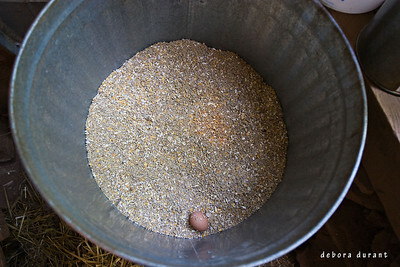 I opened up the top and before I could even get the feed scooper out of there Judy was at my shoulder trying to get in! Sure enough, a few minutes later she was happily wandering outside, having accomplished her goal. It’s been really hot this summer, so foot baths are a necessity. The chickens and turkeys will stand in them to cool off, and the chicken blog let us know that Opal would especially be looking forward to this. The side note mentions that she needs to be put in the foot bath. This is because Opal had her toes severely amputated, typical at many places raising turkeys for profit, and is also of the breed genetically manipulated to grow larger than her body was meant to be. She has arthritis, and balance can be tricky with the shortened toes. The arthritis is made comfortable by medication, and the balance issues simply mean she gets a little more help with some things, such as getting into her foot bath. 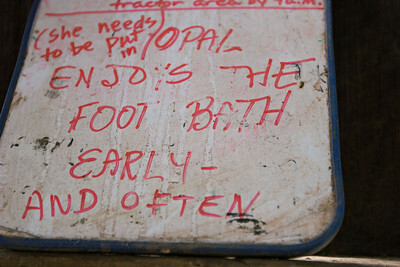 Opal was a very happy girl in that foot bath! 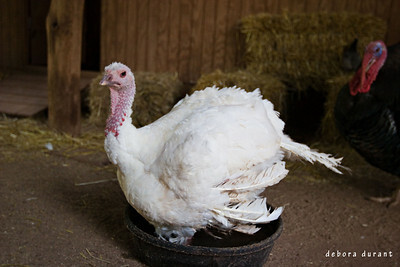 Knowing how challenging moving around can be on turkeys with amputated toes, isn’t it that much more amazing that Opal was rescued when she was found running, escaping, from a slaughter house? That’s beautiful Deb. 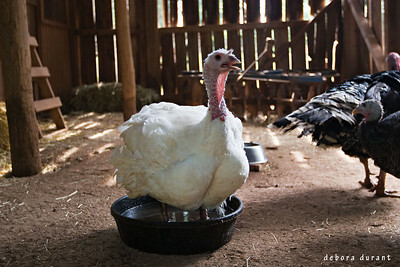 If only the people that eat turkeys and chickens would volunteer at Poplar Spring Animal Sanctuary. Every one of our ex-battery hens has not only their own distinctive personality (no surprise there) but also their own particular habits. One of our chickens, Maisey, even chases ball! They really are amazing, aren’t they? It’s so interesting the way they change and evolve over time too. I’d love t see Maisey chasing ball! I hadn’t heard of A Gentle Place before, but it looks wonderful. If I ever manage to get enough vacation time to do the cycle tour of part of Tasmania that I’ve been dreaming about, I’ll have to stop and see your sanctuary! This is awesome, Deb. 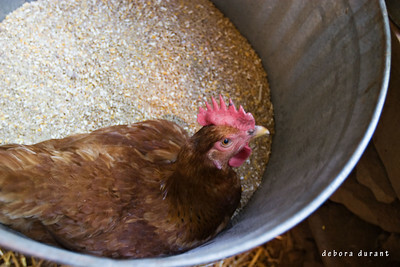 Mabel, one of the chickens at Deep Roots Animal Sanctuary, likes to climb into a cat crate every day to lay her egg. The crate was never meant to be a permanent fixture, but she quickly made it her new egg-laying spot. Now she never misses a day. Keep up the great work, Deb! I’m so glad you found my blog! Your/Opal’s story is such an amazing one, and one I can’t help but to think about often. Thanks so much for stopping by and commenting! But especially: thanks for stopping to help Opal that day. 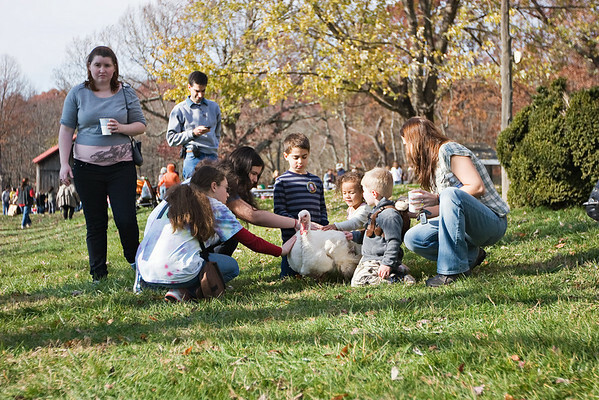 Thought you might enjoy seeing this pic of Opal – it was at a Thanksgiving With The Turkeys event a couple years back, and she was just chilling, enjoying getting all the attention. Kids loved her, and she loved them right back!